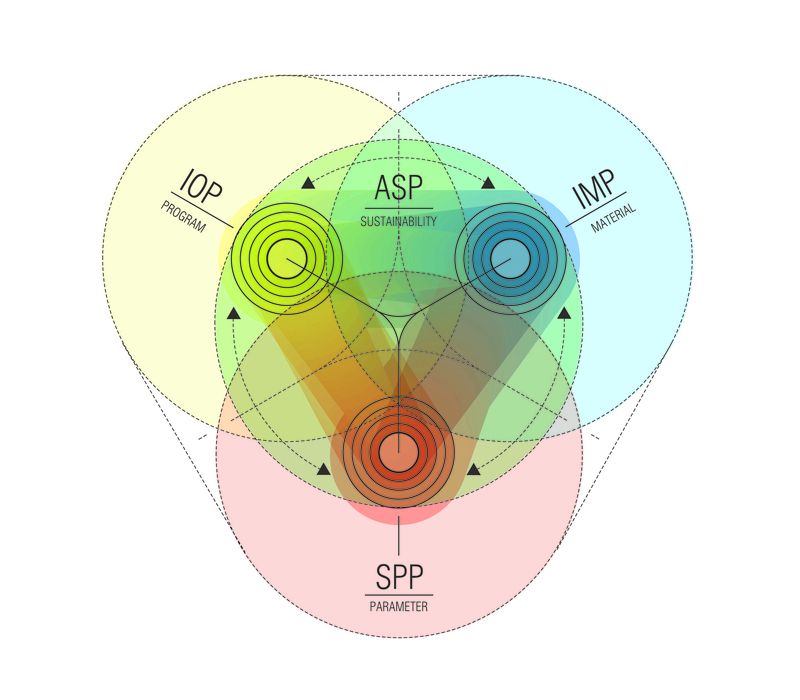 Digital and Analogue Design Output Diagram. Image courtesy of Wendy W Fok. With the progressive state of architectural tooling, as well as technological advances in digital and computational design, conflicts between corporations and bottom-up developers have become increasingly evident. Due to its lower cost of production, widely available fabrication materials and ease of downloadable models at open-sourced websites, rapid prototyping technology has raised questions about the ability to maintain ethical (downloadable prototypes of AK-47), legal (3D Systems versus Formlabs, MIT Media Lab) and material (bio-technological skins, chocolate, et al.) consistency in the use of creative resources. 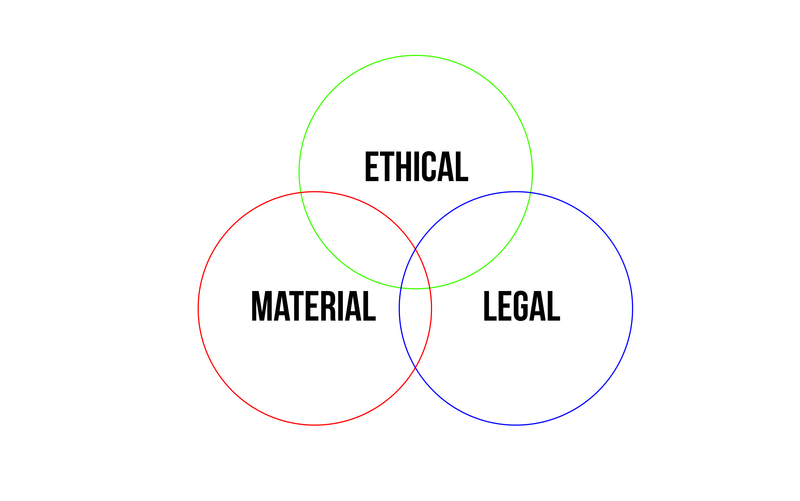 Triangular relationship between Ethics / Material / Legal Systems of Digital Design in Open Source Architecture. Image courtesy of Wendy W Fok. John Locke’s classic labor theory of private property1 is rooted in the theory that people have the right to the fruits of their labor; his argument is set in a hypothetical state of society prior to the accumulation of capital in which nature is a common resource to all. Within Locke’s ideal commonwealth, individual possession of property is defined as a natural right. However, the title of the property is secured through labor, which is the source of value.2 In Locke’s Second Treatise of Government, nature places sovereignty into the hands of the people—people are equal and invested with natural rights, free from the state’s infringement upon those rights. According to Locke, it is natural law that governs behavior. Every person has license to execute the law against anyone who infringes upon those rights. Locke’s basic tolerance of the exchange of property and rights is necessary to understand the contemporary landscape of digital property, and to identify inherent differences in the relationship between labor and value within the realm of authorship and ownership—a discussion that now must include digital and physical property. In the digital age of architecture, legalism, or the binding influence of contracts underlying design practice, deals with dependence on moral law and extralegal norms rather than traditional means of construction. Legalism is especially relevant to the discussion of open source architecture, as it increasingly looks beyond the physical and tangible world of the built environment to the intangible and networked society of the internet, open digital media and information platforms developed by software companies and computer operated programs. Legalism in this sense offers a critical lens into open innovation and digital property, automation in relation to labor, industrialization, intellectual property and policy-driven design. Within the field of architecture and design, various large, and not to mention corporate and top-down, software companies such as AutoDesk, Dassault, Adobe and now McNeel, have taken the building industry through various open innovation and sharing economy models, which encompass a more collective intelligence mentality—albeit one that serves an unbalanced form of digital property distribution. 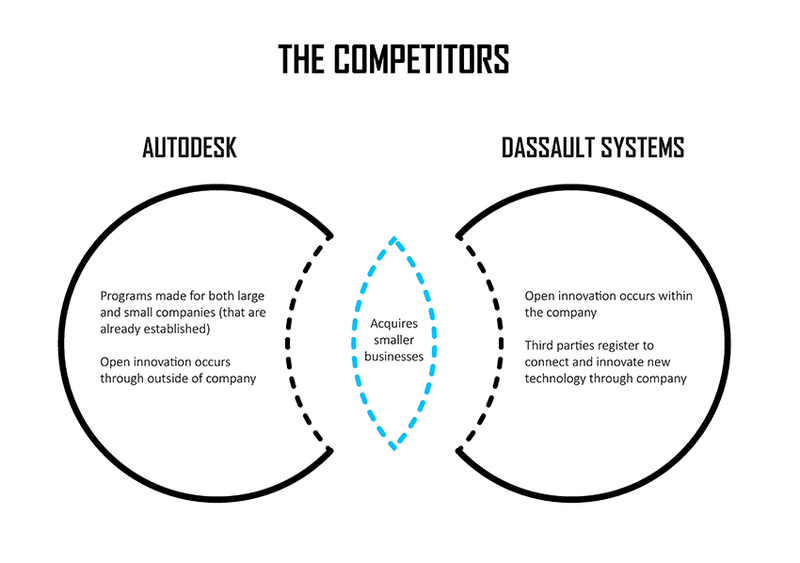 Competition structure between AutoDesk and Dassault Systems. Image courtesy of Erika Chan and Wendy W Fok. Building Information Modelling (BIM) software has created a large divide among its users within architecture, engineering and construction (AEC). With new add-ins, such as Dynamo for Revit, BIM takes on the next level of parametric design and constraints. Most of the building industry understands that algorithmic and parametric design requires highly customized construction methods, which make it extremely difficult and expensive to reconcile these projects with traditional construction methods. That being said, computational design and advanced BIM methods can produce alternative forms of construction—which in turn challenges the building industry to be more progressive. Hence, computational design can be understood as a means of applied research that exploits quantitative data. Programs and add-ins including Grasshopper (McNeel product), Dynamo (AutoDesk product) and Vasari (experimental beta software developed by AutoDesk) can be used to gather information—sun orientation, building codes and scheduling, for example—to analyze the performance of a building. Many BIM users and firms have not yet unlocked all the capabilities of this emerging technology that could save the industry time and money. By learning the parametric system, firms are able to devote more time for creativity and design. Diagram of the UN Studio Smart Parameter Platform Structure. Image coutesy of UN Studio. On the other hand, private practices and architectural design firms have commenced a digital journey to broadly experiment with open innovation platforms. UN Studio, led by Ben Van Berkel and Caroline Bos, has initiated the Smart Parameter Platform to probe the various fields of sustainability, building technology innovation, material exploration and beyond. The platform was established to broaden the field of architecture—not only allowing contributors to increase interaction and collective participation within UN Studio’s Research and Development (R&D) team, but also encouraging outside participants to better understand the firm’s research through published white papers and conference presentations. Foster and Partners also established internal Applied Research units, led namely by Francis Aish of the Applied R&D team. These exploratory and innovative teams of engineers, architects and data-scientists function within the larger firm’s factory to inquire about future alternative building technology methods in the architecture, engineering and construction (AEC) industry. Much of the R&D process is spent conducting technological analysis through experimental projects, governed mostly by data. Similarly, AutoDesk has recently heavily invested in the development and applied research of bio-nano technology, and continues to advance performance analysis, optimization, digital media and fabrication technologies within the AEC field through AutoDesk Research teams. These variable teams functions as collections or collective agencies within the larger AutoDesk corporation. They are comprised of acquired start-ups led by the SPARKS team and internal teams (a mash-up of existing AutoDesk team members, researchers and employees), and are developed through institutional partnerships that are later brought into a larger AutoDesk Research unit in Toronto or San Francisco. AutoDesk is also in the process of developing and opening a larger AEC-concentrated research center in Boston. Whether developed internally within private firms (UN Studio) or larger corporate entities (AutoDesk), these applied research and development units are significant to the future of architectural tooling and design. They promote the essential development of architects as product developers—and not just service providers—of tools of considerable importance within today’s era of digital deliverables. However, as architects and designers offer their professional expertise within the realm of digital product development, questions emerge regarding the liability and legality behind the transfer of transitional, digital (and intangible) resources into physical products. 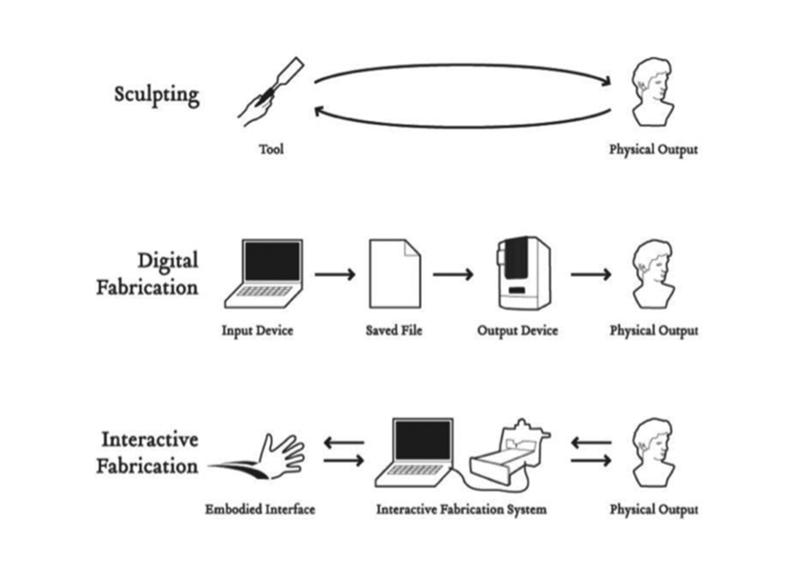 The contemporary role of the architect in producing digital goods—3D printing product development, alternative modes of fabrication and online platforms for digital delivery of manufactured goods—places the responsibility over issues of ownership and authorship on the architect directly. If today’s networked society is governed by no one, and digital products are freely accessible online, how does one operate within the realm of a sharing economy? 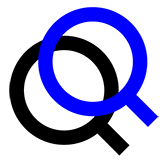 If property titles can could preclude equity and ethics online, then the designer’s principle concerns are laws that govern transferable rights pertaining to ownership, access and permission of use of files and designs; and the distribution, equitable gain and legal use of these products. Designers may also be influenced by differences in copyright systems on an international stage. There are currently two variable copyright and intellectual property systems that have divided the current American legislative and legal system from the the ever-evolving Chinese copyright system. As digital files transferred between the two countries confront conflicting trade standards, designers and architects interested in manufacturing abroad face uncertainties in their practice. As designers and architects take on a broader spectrum of techniques within their repertoire, issues of manufacturing rights and distribution will become a increasing concern within the international arena. In the case of the music industry, the distribution of digital music file recordings is evaluated in reference to the more traditional model of music licensure and the modern record production model.3 Similar to the way music licenses are streamed in live radio broadcasting, the streaming of software licenses is also commonplace within the AEC industry. In fact, in February 2015, AutoDesk replaced its traditional practice of licensing software through single registration codes to streamed licensure—a practice Adobe adopted in 2014. Driven by market needs and “prosumer” economics, this type of floating software distribution will drive the ownership of software to become more top-down. Users will be required to report to the networked community more regularly, and companies will more frequently record meta-data information on its users. Surveillance of user-information and data-distribution within the user interface will increasingly be carried out, and thus owned, by developers. The large question within this scenario is whether the ownership of digital goods still prioritizes the creator (or designer) of the designed good or the developer of the software. Meanwhile, as further development of technologies—such as OpenSim,4 Git Hub,5 BIM software6 and various other multi-user platforms7 —advance the state of participatory exchange and the collaborative measure of platforms, the question of property becomes more complicated for both the user and the creator of intangible goods. The common ownership of file distribution is further convoluted by these tangible and intangible forms of file exchanges. To rise to this challenge, designers and architects require a stronger stance on the issues surrounding the participatory governance of design within an open platform. While it is important to understand that patents, or the ownership of goods, were created to foster greater innovation—thus increasing the market for original goods—there is a growing concern and anxiety over the function of architecture as an intangible service-based industry. 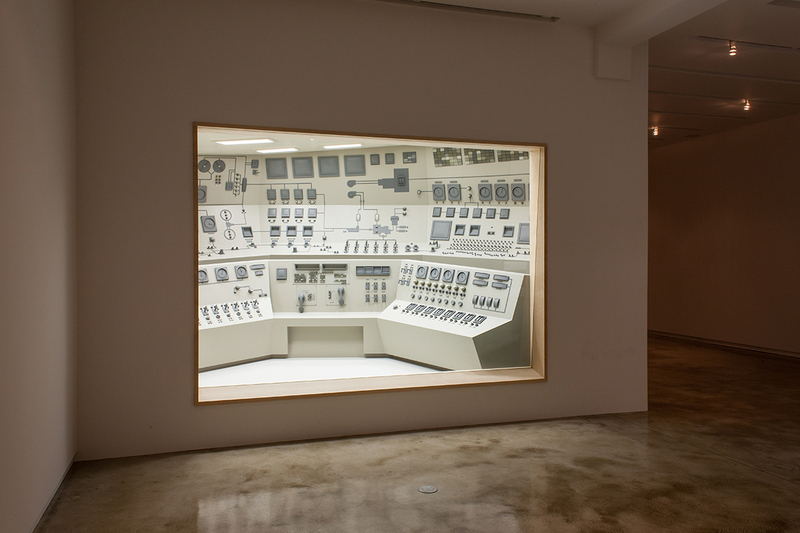 Both corporate and private digital practice focuses principally on the commoditization of labor and production within digital and computational design. It neglects the issues of digital rights within the transference between the digital and real world. In response to both intellectual property (IP) and digital communication in relation to labor and production, designers need to shift their focus in order to explore and question the contradictions at the intersection of digital technology, law and policy. The emphasis on conflict within the spectrum of digital/computational design and open-sourced information systems is exaggerated in the contemporary age of reproduction and commoditization. The most relevant discussion for architects and designers is production, which now encompasses a larger (and more public) commercial audience. As automation becomes common in the AEC field, we must address how its needs within the digital era continue to create greater value for the architectural designer to engage in the open system of computational design. 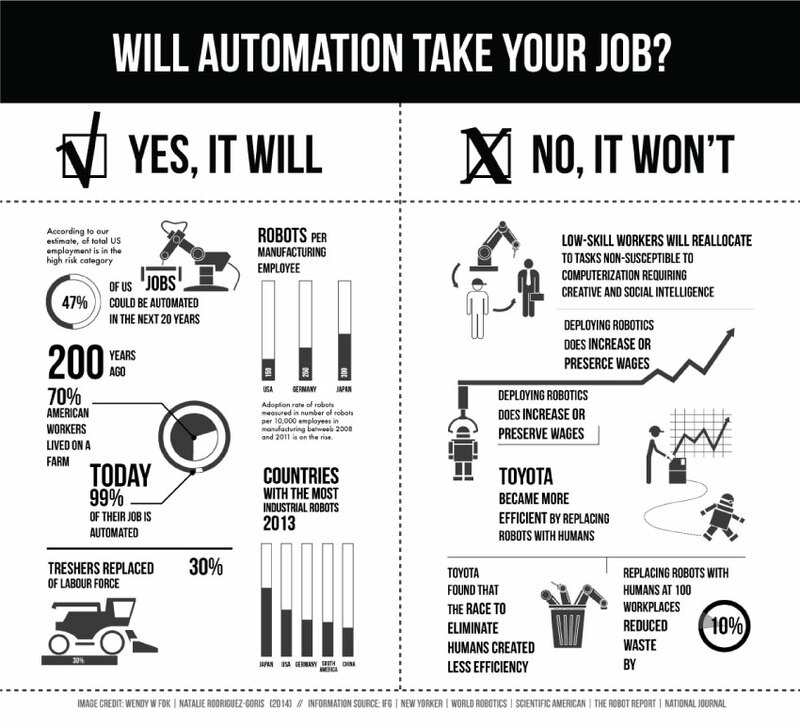 Will Automation Take Your Job Diagram. Image courtesy of Wendy W Fok and Natalie Rodriguez. Wendy W Fok, trained as an architect, is the creative director/founder WE-DESIGNS, LLC (Architecture/Creative Strategy) and Resilient Modular Systems, PBC (Socially Missioned Venture). Fok is completing her Doctor of Design research at the Harvard GSD and Harvard Law School respectively, has a Master of Architecture and Certification of Urban Policy/Planning from Princeton University, and a Bachelor of Arts in Architecture with a Concentration in Economics (Statistics) from Barnard College, Columbia University.